Dr. Padolsky makes root canal procedures as quick and painless as possible. Root canal therapy is a procedure that is done to save the tooth when the pulp (nerve) inside the tooth becomes infected. Dr. Padolsky has extensive experience in root canal therapy. His techniques are minimally invasive, which means he preserves as much of your tooth and surrounding tissues as possible. In many cases, Dr. Padolsky can do a root canal procedure in just one visit. Dr. Padolsky will gently numb your teeth and gums so you won’t feel any pain. An access hole will be drilled into your tooth, and the pulp containing the infected or damaged nerve tissue is completely removed using a series of state-of-the-art flexible rotary files. Dr. Padolsky was one of the first dentists in his area to adopt the use of flexible rotary files. After the nerve tissue and pulp is removed from the canal, the debris is flushed-out with a special solution. Topical antibiotics are inserted into the canal to eliminate any infection. The canal is then sealed with a rubber compound called gutta-percha. In most cases, a crown is then placed over the tooth after root canal therapy. This is done to protect the tooth and ensure its strength. Dr. Padolsky creates beautiful, lifelike porcelain crowns right in his office using his CEREC 3D dental restoration system. Learn more about our CEREC one-visit crowns. Even though the nerve in the canal of your tooth is now dead, the structure of your tooth is preserved and can last a lifetime. A saved tooth is always better than an extracted one! 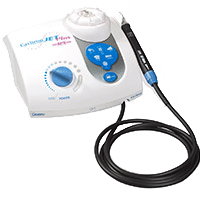 A high-tech, minimally invasive ultrasonic cleaner is used to clean and remove infected pulp and bacteria from your root canal. Dr. Padolsky uses a Piezo ultrasonic device to effectively remove debris, pulp (nerve) tissue and bacteria from the canal in your tooth. This high-tech device has built-in irrigation system to flush out the entire root canal thoroughly. It’s a no-cutting, minimally invasive method used for thorough, effective root canal therapy. Root canal gone bad? We’ll fix it. Dr. Padolsky will do retreatments of other dentists’ root canals on patients where complications or problems have occurred after the procedure. In this case, more than one visit may be necessary. As bone damage may have occurred from a root canal procedure gone wrong, Dr. Padolsky will use MTI Bone Healing materials (bone growth factors) to induce new bone growth to help repair these types of root canal problems. Dr. Padolsky is meticulous in his root canal therapy procedures. He is highly trained and very experienced and is able to perform even the most difficult root canal therapies. If you’re noticing pain or have an abscess, you may need a root canal. Sometimes, you won’t feel any pain. There may also be swelling around the gum line or a pimple near the tooth. Some tooth discoloration may also occur. If you are experiencing tooth pain or have swelling or other signs of a root canal, you should come in right away to be seen. 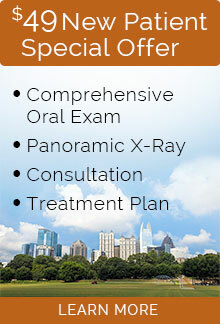 Dr. Padolsky offers new patients a very special $49 Exam, X-rays and Consultation.